Over the years, I have built up quite a collection of vintage haberdashery, beautiful fabrics and beads. Much of it, I cannot bear to part with, but I do sell some of the buttons, ribbons, buckles and fabrics in my Etsy shop alongside the sewing patterns. These are all only available in limited numbers. Some are original pieces from the 1950s through to the 1990s while others I have bought for their retro appeal. I also stock a limited range of new fabrics that are woven in one of the few remaining mills in the north of England. 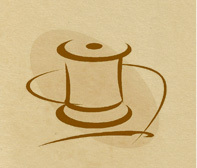 This includes cotton moleskin, velvet, corduroy, cotton canvas and drill. These are hardwearing traditional British fabrics destined for the high end country clothing market and they are highly suitable for making up in Charlie’s Aunt designs. My favourite fabric is handwoven Harris tweed and I also sell pieces of this precious cloth that I have left over after making the bag and hat samples for the pattern covers. Finally, I sell stunning pieces of silk jacquard fabric woven in my home town of Sudbury in Suffolk. Again, most of these fabrics are not available to the general public and are commissioned and used by top fashion designers worldwide. Many of the buttons come from a shop in Suffolk, which closed down about 20 years ago but was run by two lovely elderly ladies who had kept the store going since the 1950s. The stock was kept in brown cardboard boxes in wooden display cabinets. It was a fascinating shop and I treasure the beautiful Bakelite and Lucite buttons I acquired from there. The other buttons are left over new stock from when I ran my vintage inspired clothing business in the 1990s. In addition to the above, I offer limited edition kits containing pattern templates where appropriate, detailed instructions and most materials required to complete the project. For example, I am currently offering kits for “Bon-Bon Clutch Purses” that contain either handwoven Harris tweed or Sudbury silk, a zipper and all of the material you need to make one purse. 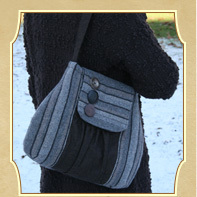 The templates can be used again to make your own versions of the purse. Other packs I offer from time to time include wool tweed Melford Messenger Bag kits containing handwoven Harris Tweed, a long leather strap, a magnetic snap, vintage buttons for trimming and a professionally printed sewing pattern. These wool fabric packs are great value for money and will enable sewers to replicate the Charlie’s Aunt signature look. For current sewing supplies and kits, visit our Etsy shop atwww.charliesaunt.etsy.com and check regularly as new items will be added weekly. See the gallery below for some of the items.